Located at the Old Rittenhouse Inn building, this is one of two spacious first-floor, handicap accessible rooms in our Bayfield, Wisconsin lodging. It features a king bed, love seat and wingback chair. The area around the elevated whirlpool tub is lit by stained glass windows depicting Bayfield’s commercial fishing heritage. The private bath has a tub/shower. 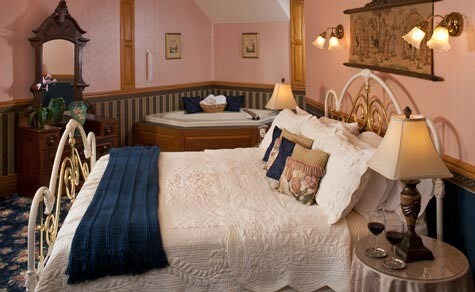 Luxury awaits in our Bayfield, WI bed and breakfast. An assortment of cookies, gourmet truffles, and/or chocolate confections await the arrival to your room.